búp bê barbie in a Mermaid Tale 2 - Mini Những nàng tiên cá And Những người bạn. . HD Wallpaper and background images in the phim Barbie club tagged: barbie in a mermaid tale 2 upcoming movie mini mermaids companions 2012 dolls toys. First thing that pops into my head when I see this are the sprites' dolls and mutant seahorses from PCS. Same here. I also thought of the merfaries from Mermaidia. Mattel are a bunch of lazy bums. That's just Destinies, calm down ragazzas. Wait. Guys! That girl from the upper left was Merliah! Who's the others? And those dollies at the bottom looks like "Peek-A-BOO" petites. I wonder what Miss Harrison meant to say. That was Merliah? Huh? That's just Destiny 2.0. Melodylaurel - that's because they're basically the same thing, and THEY'RE basically Destiny clones. 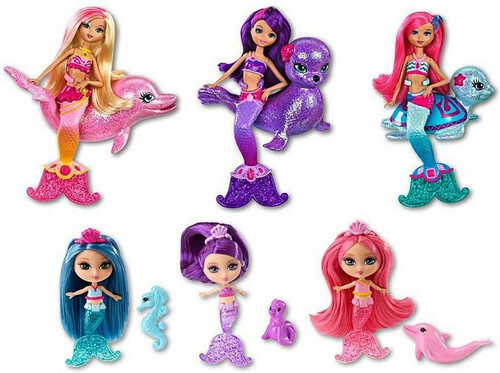 Mattel, I'll cut you a bit of slack on the lack of Major Mint and Miss Privet dolls if you only got rid of these things. I think BarbieRosella wanted to say that the one in the upper left corner looks like Merliah (with the pink streaks and all). I totally agree with you. Mattel is basically just recycling their old dolls. I mean, the headmold of Blair from PCS and Merliah from MT2 is pretty much the same. And those triplets appear in pretty much every movie nowadays. It's so strange. Mattel was a pioneer when it came to doll-making and now all the desire is gone. All they care about is making profit..
MJsValentine: Exactly, and I honestly cannot stand those triplets. I swear they only appear at all so Mattel can recycle this mold (I mean, sometimes they barely even appear at all). At least they bothered to make the Kelly dolls look somewhat different; and at least THEY were cute. Sorry, but I just think these things are ugly.